MTM: What is respect and why is it so important in families? SLL: Most people who study respect talk about it very differently than I do. They talk about it in a hierarchical, pyramidal way—with the more powerful people at the top and the less powerful at the bottom. Those at the bottom are supposed to be deferential to those who have more skills and more power. Approbation is given to those at the higher end of the totem pole. One is respectful to one’s elders, to one’s teachers, to the CEO of the company. It’s fairly impersonal. My approach is to reframe the whole notion of respect. The image I use is of a circle, rather than a pyramid. Even if there are differences in power, knowledge, or resources, there is still a symmetry and equality to respectful relationships. It is respect that creates that symmetry. I watch for the nuance and detail of how people communicate respect— how it really looks in action. Respect is rarely carried just in talk. We see respect more clearly in behavior, action, and interaction. Children learn about respect primarily through watching their parents operate—watching how they treat their neighbor, or how their parents show respect with money when the children are given an allowance. In families, it is respect that generates a feeling of empathy for one another and appreciation for what each contributes in different ways. This respect builds trust and communication. An example is the common scenario where one spouse is making most of the money—or there is some other unequal amount of resources coming in. That should not mean that the person who is bringing in more resources should get more respect. In our society, so much of people’s worth gets equated with how much money they make—with material resources and wealth. The view of respect I take challenges those inequities and those hierarchies that are based solely on material resources. So I view respect as carrying empathy and trust and communication among equals. Whoever you are, you are worthy of respect. That respect creates the equality. MTM: How can families cultivate respect? SLL: It’s more about doing and embodying than it is about telling and teaching. When I was a small child and lived out in the country with my family, we would sometimes come into New York City in our Ford station wagon, with my siblings and me in the back. I remember driving across the George Washington Bridge and my father paying the toll, which was 50 cents at the time. The people who collected the tolls wore uniforms, and they had their names on them. My father would greet them every time, saying, “How are you, Mr. So-and-So? How are you doing today?” He would look directly in the man’s eyes. He established contact. He would always reveal a kind of respect for this man and what he was up to. I remember that, and watching the man’s surprise that anyone would greet him by name and actually look into his eyes. There was a wonderful moment in that surprise. I remember watching that as a child, and then later, anticipating that— and getting such pleasure out of seeing my father doing that. Children do that. They watch their parents cultivate respect in their relationships. This giving of respect can feel almost invisible. It is carried in those small gestures—not in great, bold proclamations, but in small moments of surprising intimacy and empathy. It is particularly important for people who are “invisible” in society to experience this kind of respect, because we generally don’t pay attention to the work they do or the contributions they make. MTM: In your book, you discuss different dimensions of respect. How do those relate to family differences and money? SLL: Empowerment is one dimension I explore. When we are respectful of others, we try to figure out a way to offer them the knowledge, wisdom, and resources that they need to be able to take care of themselves and navigate in the world. One way to give respect is to share information; to help the other person in a relationship or family develop financial skills and knowledge, as well as the resources needed to take part responsibly in that process. Imagine a conversation about money where you are not withholding information, not keeping secrets; instead, you are offering up what you know about money, and the ways you know of to take care of it. Respect is carried through the empowering process. As you empower others, you are offering them respect. Another dimension I examine is dialogue . This involves communicating honestly, listening to the interplay of ideas, developing a discourse that’s meaningful and authentic, and finding a way to move through misunderstandings—even through rage and anger, towards reasoning and reconciliation; hanging in there and trying to go back and renegotiate the conversation. Those are crucial for conversations about money, which can be so hard to talk about in families. With money, we all come carrying such baggage from our own families of origin—how we were raised to attend to money, to value it, to hoard or not hoard, splurge or not splurge. 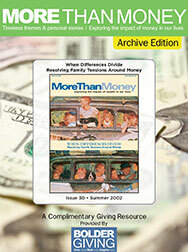 Every family has a money curriculum that gets taught over time and is passed on to the next generation. In couples, each partner comes with a different curriculum. Respectful relationships need to begin to expose the principles of those curricula and to enter into a dialogue that expects conflict and is able to move through it toward reconciliation. This is not just one dialogue—it isn’t as if you sit down at the kitchen table and say, “Let’s get this settled”—it is a conversation that is reiterated time and again. These are deeply held values and it’s important to be able to discuss them over time. People’s perspectives change and evolve and the dialogues need to be able to address those developments. Attention is the quietest of all the dimensions of respect. When you are respectful of another, you try to listen and be receptive to what a person is really saying. It doesn’t necessarily mean that you are always quiet. One can attend in a dynamic and vigorous way. So much of what we take for communication and talk doesn’t include genuine, undiluted listening. Being completely present and engaged is what I call attention. Because money conversations are such hard conversations, and because people often get defensive and calculating, people tend to talk over or past one another when discussing money, instead of to one another in an engaged way. The respect we hope for in a conversation— this quality of being completely present—is really important with adolescents. I suspect that most of the fighting between adolescents and their parents is not about drugs, alcohol, or school, but about money. Money stands for both independence and dependence. To assert autonomy in our society, young people need money—they need it to take a girl out to dinner, to make a trip down to New York— but they also need to be dependent on their parents. Parents often use money to control and manipulate and keep their children dependent. Navigating that treacherous relationship requires a great deal of respect. I remember my children saying, “Mom, be quiet and listen to me.” When I don’t listen with this quality of attention, they experience me as talking over them, not really being prepared to listen to them. But when I bring my full attention and open myself up to whatever their point of view is—when I put myself in their shoes empathically, to see what this money thing might be for them, they feel I’m really listening, a sign of respect. So all of these are vital to respect in families— empowerment : giving kids, and others, the resources and knowledge to act responsibly and to be accountable in reference to money; dialogue : learning how to move past differences toward understanding and reconciliation; and attention : having your receptive antennae up, being restrained, not talking over others, trying to genuinely listen in a complete way to where they’re coming from. Respect is carried in all of that and might have a whole lot to do with figuring out a way to put money in its rightful place in families. MTM: Why do we so often not offer respect? Why does it seem so hard to do? SLL: To be respectful inside families is so much harder than out in the world. It’s hard to sustain and nourish respect day by day. When a three-year-old grabs her mother’s cheek and turns the mother’s face toward her, so the mother has no other option than to offer this kind of attention, the child is demanding that the mother listen to her. Yet the mother is so tired and exhausted at the end of the day. The ways we know respect needs to be nourished get left at the door when we walk into our homes. But we need to be attentive to nourishing this respect—not taking people for granted; finding ways to nurture, to look people in the eyes, respond to them, and not talk over them. All of that is extremely hard to do inside families. I experience it constantly, especially when I return home from being out on the road talking about my book on respect! It is then that I experience how very hard it is to actually live that message with my daughter who is 21 and my son who is 19. It is harder, too, in families because you care so much and so passionately. The stakes are higher in doing this work of respect in your own family. Also, because respect is carried gesturally, people who love us know what we are really communicating, even when it would not be visible to those who know us less well. In a recent fiery conversation I had with my son, he said, “I’m going to ask you to take that smirk off your face.” No one else would have seen this “smirk,” but there must have been something in the curl of my lip or the crinkle of my eye that communicated disrespect to him. He couldn’t have a serious conversation with me because the expression on my face felt to him disrespectful. All of this is part of the embodiment of respect that is required in a family. It is much more rigorous than when we’re out in the rest of the world. For all those reasons, giving respect is that much harder to sustain in families. Dr. Sara Lawrence-Lightfoot, a sociologist, is Professor of Education at Harvard University. Her works include Balm in Gilead: Journey of a Healer, I’ve Known Rivers: Lives of Loss and Liberation, and The Good High School: Portraits of Character and Culture . Her most recent book, Respect: An Exploration (Perseus Books, 1999), is an in-depth examination of the nature of respect as it occurs in individual lives. Dr. Lawrence-Lightfoot is the recipient of numerous awards, including the prestigious MacArthur Prize and Harvard’s George Ledlie Prize for research that “makes the most valuable contribution to science and the benefit of humankind.” She is currently chair of the board of the MacArthur Foundation. Here, she offers reflections on how respect applies to families and money.